Basically you would start by signing up on Fiverr. Check out the Writing/Translation section, then Proofreading, on Fiverr to see what others are doing as far as gig offerings … how many words will they proofread for $5 (remember you only get $4 of that)? How fast is their turnaround? How fast can you turn something out? I started out proofing 3,000 words for $5 and got busy but wasn’t making good money at all. Now I stick with 1,500 words. Some can get away with only 750 words, and those are usually the people with an English degree! Then fill in a wonderful profile with your photo and information about yourself. Check out other profiles to see what others have written. If you'd like to see my profile and gigs, I am here. After your profile is polished, create a gig. You can create as many gigs as you like. I believe you have to wait 30 days to be able to offer Gig Extras like charging more for extra fast delivery, proofreading more words, accepting a tip, etc. Offer, for instance, to proof 1,500 words for $5. Can you do that in about 15 minutes? Good! Then you’ll be making double minimum wage in America while working from home (just don't forget taxes)! You can offer to proofread large projects or stick with small ones. You can adjust your delivery time if you get swamped. 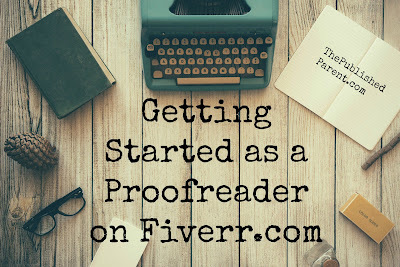 Yes, there are tons of other proofers on Fiverr, so you have to stand out. Make a video to go with your gig and make sure you say your price is “exclusively on Fiverr” or it will be rejected. Use social media, friends, anything you can think of, to promote your gig. Please use the comments section to ask me any questions I may have forgotten to answer and I will update this post accordingly. Check out this post on 9 places you can find a job as a proofreader!